I was at home and probably around 14 years old at the time. I was walking between the television and my computer as I used to. I would surf the net, then I’d hear something interesting from the television which my mom and dad was watching and I would walk over to see. Then back again to my computer. I was pretty bored. But this was my routine. I had been interested in computers for a while, and I had started learning a bit of programming/scripting of the mIRC client which was really popular back then. Something interesting came up on the television, so I walked over. Suddenly, the doorbell rang. My dad got up, turned the TV on mute, and went over to see who it was. I noticed something. There was a red light on the television that was blinking. It was probably because the TV was on mute, but I had never really noticed it before. My brain started getting curious. How can you make a light blink like that? I started thinking about it more and more. How does a flashing light circuit work? I had never looked into this before, so I was totally blank on how that blinking light could actually work. The more I thought about it the more I wanted to find out. So I asked my dad. “I don’t understand it. How can you make a light blink like that?”, I asked. Something lit up in my dad’s face. “Wait here”, he said. Then he walked into the kitchen, got some pen and paper and came back. He sat down and started drawing. 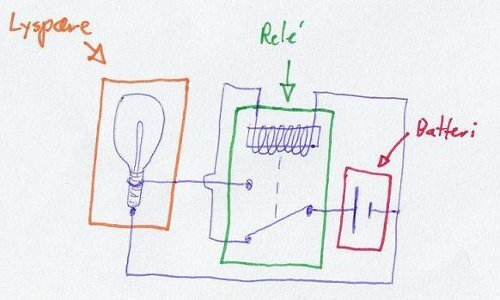 He drew a small circuit diagram consisting of a relay, a light bulb and a battery. It was the flashing light circuit. “But how does the relay make the switch change positions?”, I asked. Then he explained to me how a relay works. As soon as I understood that, I was able to understand how you make a light blink. And I was in ecstasy! I had to build this! Luckily my dad was an engineer and had some relays laying around in addition to the necessary soldering tools. So I ran down in the basement and started building the circuit. After some messing around I managed to solder all the components. I attached the battery, wildly excited. “DRRRRRRRRRRRRRR!”The relay made a continuous and really fast switching sound, and the lamp did not turn on. I went back up to my dad. “Well, you need something that can store power for a short while to slow down the relay switching.” he said. “You mean like a rechargeable battery?”, I asked. “Well, yeah, in a sense. But in electronics we have a component called a capacitor. It works similar to a rechargeable battery, but the capacity is much lower. A battery can usually work for a few hours after being charged, but a capacitor usually only works for a second or much less after being charged. So, back in the basement I solder a large capacitor over the relay coil. I turn the power back on..
Then the light turns on and there is silence. Then the light turns off and there is silence. Light off.”YEEEEES! Dad! I’ve done it! I made a blinking light! !”, I shouted to my dad. Oh, the feeling I had. It is the greatest feeling in the world. I just knew that I had understood something that I could apply to a lot of things later on in my life. I had reached the next level in my technology life. The flashing light circuit would be on my repertoire forever! I go up to my mom and dad and sit down with them in front of the television. I just sit there and smile, knowing that life will never be the same again. Then suddenly a new thought pops into my head.